I was browsing my favourite cooking magazine, Sale & Pepe and found different pies and gallettes filled with fresh fruit! I knew I had to do one myself and pair it with some home made vanilla ice cream. Turned out to be quite a good idea! Yes, really, this is all you need! 1. 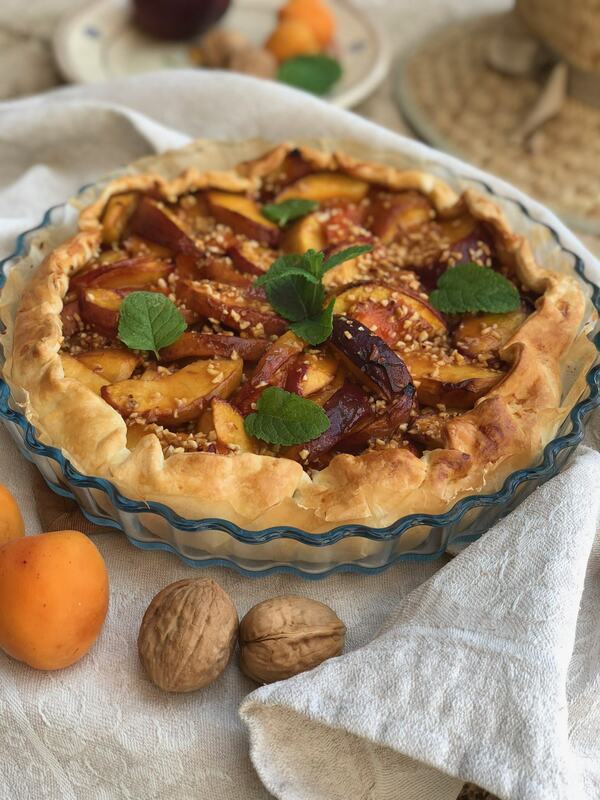 Wash and cut the 4 peaches and 6 apricots in slices – the apricots will probably melt, so don’t worry about them looking pretty. 2. Preheat the oven at 190 degrees. 3. In a pan melt 1 tbs of butter (or vegetable oil, like coconut) and add the cut fruit. 4. Add 1 to 2 tbs of maple syrup (or raw sugar or other sweeteners of your choice) and mix together. 5. Cook for about 5 minutes. Then set aside. 6. Lay your puff pastry on a baking tray or baking tin. Spread some chopped hazelnuts (10-15g) on it. 7. Separate the fruit from the juices with a strainer and collect the juices for later. 8. Pour the fruit on the puff pastry. You can make a nice pattern with the slices if you feel like doing a fancy pie! Fold the borders over the fruits. 9. Sprinkle the top with the remaining hazelnuts. 10. Bake for approximately 30 Minutes or until the puff pastry is golden. 11. Now with the help of a brush, spread the juices over the fruits, this will make it shiny and moist! 12. Let it cool down for at least 15 minutes before serving – it’s delicious also cold. 13. Decorate with mint leaves if you wish. 14. 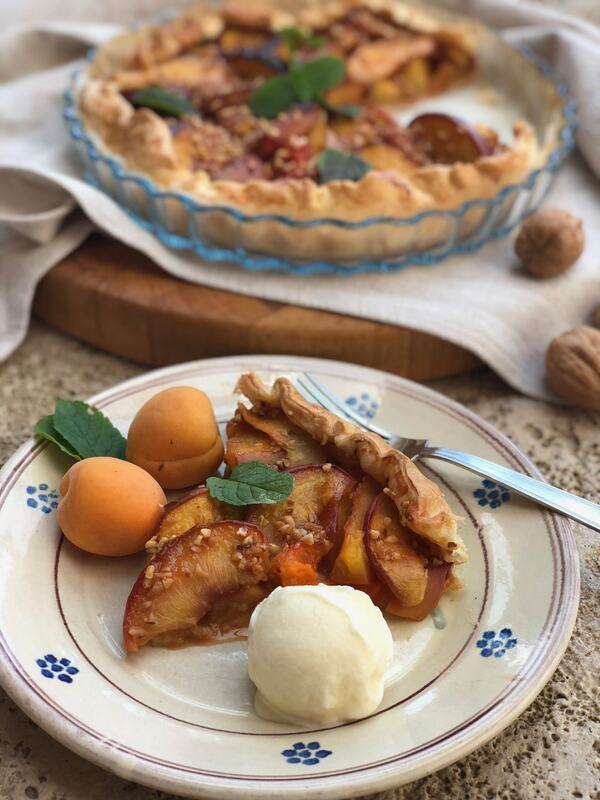 Serve with vanilla ice cream and enjoy!! Mix and match! 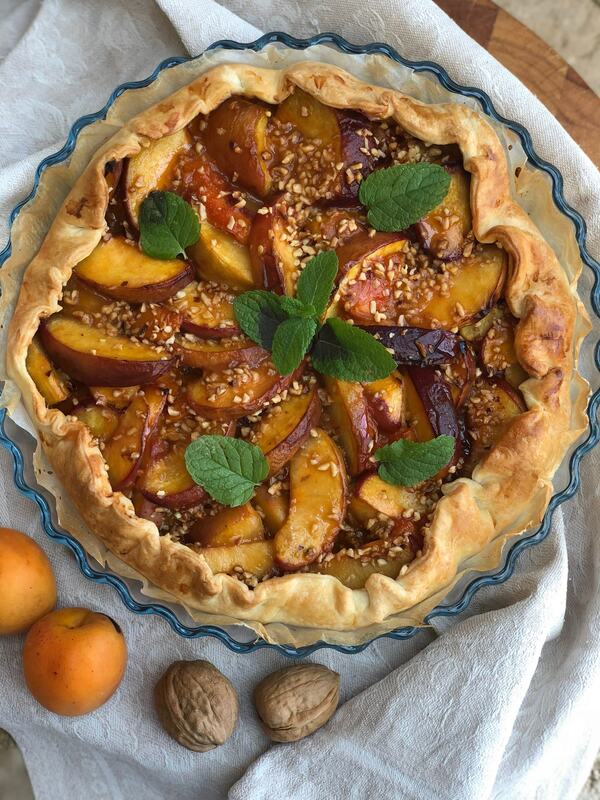 You can use different fruits and nuts and make a new lovely pie every time!